For UMass Lowell’s Mock Trial team, it has been a year of changes. With only three returning members the team’s roster is almost entirely new, and with new members also came a new coach. The team has embraced the changes and have come back just as strong if not stronger as they head into regionals on Friday, February 15 for the two-day tournament held Yale. They will be competing against about 30 teams. Five to six of those teams will be allowed to continue to the Opening round championship (ORCS) held at Boston University in March which will determine which teams from each region will go the national competition. Every year a single case, alternating between civil and criminal, is distributed to every team in the country. They are long, detailed and purposely balanced so that each side, plaintive or defense, have equal footing to stand on. Matches are scored using a rubric with 140 possible points earned based on how well the witness and attornies play their part, the quality of opening statements and the quality of cross-examination. It is not a matter of guilty or not guilty, but rather how well each team presents their case and each member fills their role explains David McCauley, a professor of criminal justice and one of the team’s coaches. Like any other sport, it is about the score in the end. McCauley has high hopes for his team this year. If the rankings are anything to go by, then he has good reason to be so confident. The team is ranked 153 of the almost 450 ranked teams in the country and is the second-best state school in New England. The team attributes a lot of its success to its coaches like McCauley. Although this year marks the retirement of the team’s longtime coach and mentor Dr. Frank Tully, who created the team in 2006, the team remains in good spirits and keeps in touch with their mentor. This year the team gained a new coach. Zachary Marshall-Carter, a recent graduate of the University of Rochester who has four years of experience in Mock Trial and has been to all three levels of the competitions. Marshall-Carter brings with him experience in Mock Trial litigation in comparison to the real-world litigation that Dr. Tully and Professor McCauley bring. Both, the team says, are critical to success in the competition and have been incredibly helpful. It is not just the coaches that have gotten them here. There is also the team spirit they have developed over this season. Having so many new members come in at the same time allowed the team to start on even footing and learned together. The team meets two times week at UCrossing and often goes over time making sure they have memorized their directories and have prepared for there opponents every possible move. In addition to the long meetings, they find themselves spending hours with one another drilling through a few questions at a time. As they reach crunch time, Casey jokes she finds herself practicing her opening around campus, and in the shower. “It’s truly an adrenaline rush. That feeling after trial knowing you did well– hoping you did well and waiting for the results and really knowing that you left everything you could out there,” said Callahan, comparing it to any other sport. “At this point, I think I could do anything,” said Callahan, reflecting on all the things that the experience of being on the team have given to him. Among the group, confidence seems the biggest take away: confidence in their oral presentation skills, confidence in themselves, confidence in their ideas and confidence in their ability to communicate effectively and clearly. “I don’t know how many engineers I know that are brilliant. They have great ideas and will never be able to communicate them to anyone because that ability to make a logical argument and to be able to convince people of your idea is so important. 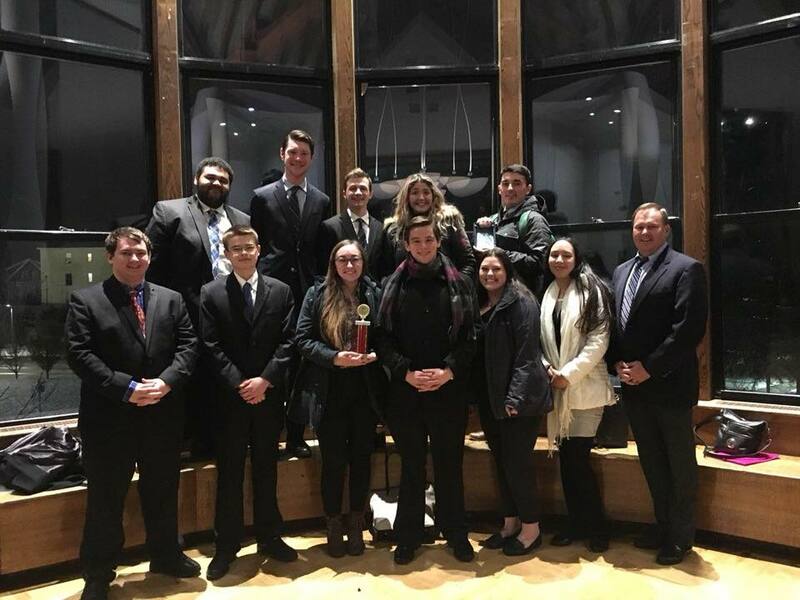 [Mock Trial] teaches that so well,” said Sam Frederickson, the team’s captain and president, elaborating on just why the club is so helpful to students in every major including S.T.E.M majors. “I know we said it’s a lot of work and it can be tiring, but then you see all of your work pay off in such a dramatic way when your team pulls it together,” said Fredrickson. For students interested in trying the club, Fredrickson encourages people to stop by practice and just watch– no obligation. The team meets every Monday and Thursday at 6 p.m. in UCrossing room B156 near the UCaps and UML PD’s Offices. Come March the team will be working on a new case for nationals which they hope to be attending this year.